of the chicken wings I'm frying at home. Last month, I spent the better part of a week in Portland, Oregon. Like so many before me, I was smitten. Can you blame me? I’m from San Diego, a desert town on the coast. It’s hard not to be taken with Portland’s lush greenery and air so moist you can feel it even on a sunny day (or, rather, during sunny parts of most days). Add to that the breweries, the distilleries, the Bookstore, hiking out in the gorge, the cocktails, and the food…oh, sweet Jesus, the food. We ate. When someone asks me what we did in Portland, my answer is simply: we ate. Bacon macaroni and cheese from a food truck, sour cherry water ice, bulgogi tacos, truffled popcorn, pickles, ice cream sandwiches, fried-to-order chocolate donuts, pork ribs, chicken fried steak, boar, an amazing red pork stew, cured meats, cheeses, biscuits, fried chicken, berries, cherries, lefse, blue cheese burgers. I didn’t feel right for a week afterward. It was glorious. A plate of spicy chicken wings at Andy Ricker’s restaurant Pok Pok, though, was so good that we ordered another round even though there wasn’t one single hungry person at the table. I’m not the first to write about the wings. I won’t be the last. The have a fame of their own. When my friend Barry sent directions for making them from a 2008 Food & Wine recipe, I bought three kilos of flappers and broke out the fryer. It was too much. None was left. The menu calls them Ike’s Vietnamese Fish Sauce Wings. 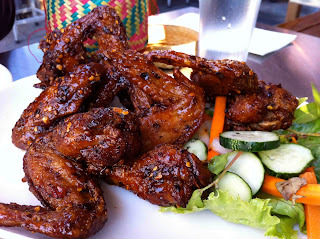 No disrespect to Ike, but most everyone I spoke to in Portland called these crispy glazed chicken wings Pok Pok wings. In brackets are my adjustments and notes. You’ll notice that I like garlic and heat. To add some spice to the glaze, I added a healthy dollop of sambal oelek, an Indonesian crushed chile paste that’s widely available even in whitebread grocery stores. In a bowl, whisk the fish sauce, sugar, [sambal oelek, if using], and crushed garlic. Add the wings and toss to coat. Refrigerate for 3 hours [more than that and they become oversalted from the fish sauce], tossing the wings occasionally. In a large pot, heat 2 inches of oil to 350°F. Pat the wings dry on paper towels; reserve the marinade. Put the cornstarch in a shallow bowl, add the wings and turn to coat. Fry the wings in batches until golden and cooked through, about 10 minutes. Drain on paper towels and transfer to a bowl. Salty? Yes. But not too much so as long as you don’t overdo the marinating time. Cook a pot of plain white rice, crack open a beer, and make sure you've got plenty of napkins. Pok Pok is a Portland gem; always packed no matter when you go. Glad you enjoyed it, and our fair city! Enjoyed it? Hell, I was looking at real estate by the end of my first day. Oh, yes, I'll be back. Hey Adriana ~ The wings are well worth the obsession. Never heard of the Marin Homestead blog, though. 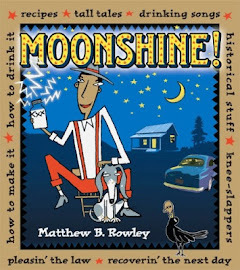 I'll take your word that this recipe is published there, too; as I said, it's from a 2008 issue of Food & Wine. Sounds like we got the recipe from the same source. Identical to Pol Pok's? No. Delicious? You bet. Bless you, sir. I'm so happy I can come even close to repeating this experience. Delicious! I still have chicken wings in my freezer,will give it a try.Thanks for sharing.